Register Log In ECN Forum Forums Photos for General Discussion Is this a health hazard (Part 2)? A recent post asked about dead bugs in a light fixture. These pics show a related problem. Pigeons have learned that they can chew through plastic lenses. Here is a recessed fixture whose lense was opened up so that a nest could be built inside (there was no bulb present). 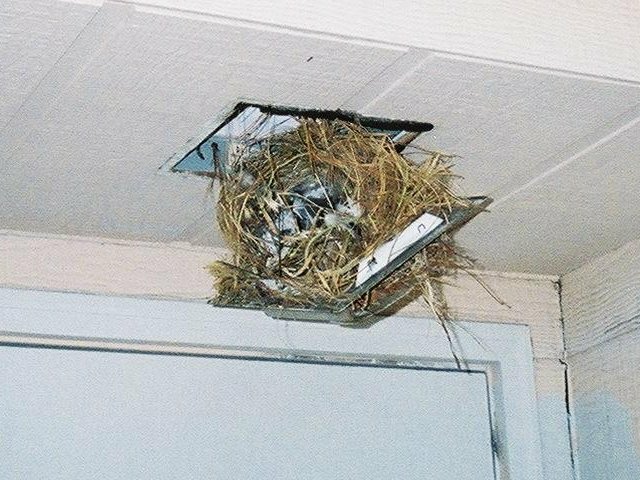 As you can see, the fixture contained a rather substantial nest. I caution all regarding bird nests, droppings....those of pigeons in particular. I personally know a man who caught a respiratory infection that nearly killed him, and left him blind, as the result of clearing some nests and droppings off of a roof. A review of medical literature shows that this is neither far-fetched, nor particularily rare. Those who think of pigeons as "rats with wings" aren't all that far off the mark. What a mess! Indeed it is an understated hazard, most people don't realize how bad it can get. Even crawling in attics can be hazardous if there was ever a rodent infestation. As a minimum for personal protection, a disposable surgical mask [the flat pleated type] (they are available in most drug stores and are pretty cheap) and disposable latex gloves should be worn when encountering anything like this. Remember when finished working to remove the gloves first, then the mask, then immediately wash your hands and arms with lots of warm water and soap. It's called 'Pigeon Fanciers Lung', or interstitial pneumonitis extrinsic allergic alveolitis for short. Caused by breathing the dry feces of a small mite found on birds. Most birds have these, including canaries, budgerigars, parrots etc., but pigeons seem to affect folks most, usually from nesting materials. Looks like one of those cheap Halo plastic lenses,and "Flying Rats" is the best discription I have ever heard. I don't find the "pigeon poo" illness at all surprising. Earlier this year I got a case of Valley Fever, a dust related fungal illness that's mostly just a West Coast thing. 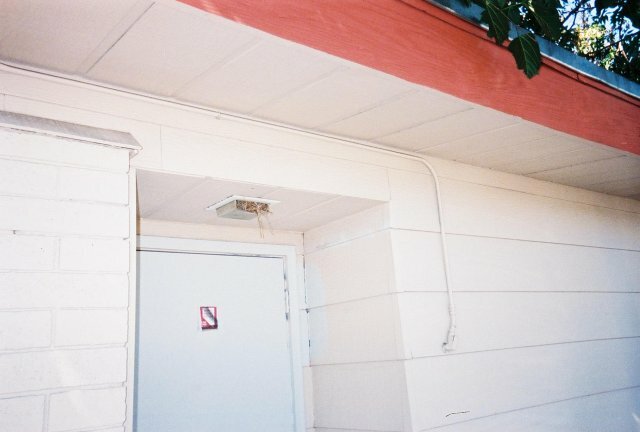 The way I got it was a "belly crawl" beneath a house that hadn't had anyone beneath it since it was built in the 1920s. Apparently, the little critters can remain in a dormant state until the soil is disturbed, and they find a host (Me without a dust mask). This started out feeling like a New-Years-Day-quality hangover headache, and kept me in a state of constant fatigue for about 6 weeks. Elderly, very young, or people with poor immune systems often aren't so lucky. I now carry a whole box of dustmasks with me, and I use them. Thats VERY scary, and I'm so glad you recovered, but listen to this. My wife worked for a biologist as a lab tech. in the UK. He's retired to the Bordeaux area and writes a monthly column in our english-language French newspaper, on bees, flowers that sort of stuff. In recent years,it seems european farmers have been making silage for animal feed, not in the age-old way in a pit, but by wrapping the grass in plastic sheet to form a ball some 3 ft across. These balls have proved an ideal breeding place for a normally very rare but horrific fungus, the spores of which if breathed in grow in you instead! I'ts hard to diagnose, looking just like a nerve tumour, so unless the patient has a switched on MD, it kills you slowly while you undergo useless and painfull chemo-therapy. His advice to anyone seeing a bracket-fungus growing on one of these balls is to RUN! And another: Ooh-er! In the late middle ages, around Sheffield England, they began to clear an ancient forest for charcoal (ironmaking) and farmland. In the soil lurked a deadly virus, which infected the foresters and their families. Church records state they all died of 'Sweating Sickness'- they literally sweated to death in agony. Next year, more deforestation and the disease struck again, but then there were a few survivors. It never appeared again. Seems likely it was like 'ebola' virus, and could not survive long outside the soil environment. Oh Geez.... I read this just after working under my fiancee's turn of the century house trying to eliminate someone's brilliant idea of tapping off the old K&T with AC cable... I've never been the arachnaphobic type, but there's more webs and black widows under this house than I've seen in my entire life... I thought that was all I had to worry about! While you're still here, where the hell is that warehouse with the 50 cycle 22ov box!!!! I'd just like to reassure you all that the dreaded 'Sweating Sickness' only lasted for a brief period, lethal though that was- it appeared in 1485 bought from France probably by Henry VII's army who defeated Richard III at Bosworth Field in that year, ("A horse, my Kingdom for a horse! "), and reappeared in 1506, 1517, 1528, 1551 and 1578, and never appeared again. I got the town wrong, the most virulent epidemic began in Shrewsbury- not bad- I got the first two letters right! Most modern investigators put the causes as the general filth the English lived in at that time, (we never washed!) or poor nutrition, some ascribe it to tick bites, fleas etc, others to a hansavirus. Whatever, it could and did kill in hours, and survivors gained no immunity from surviving an attack, leading one researcher to speculate that it may have been a toxin carried by biting insects rather than an actual organism. Also it preferred Englishmen- French, Irish, Scots etc appeared to be immune, but it felled Saxons in parts of Germany. Very strange.